The level of forward participation in global value chains is expressed as the presence of domestic value added in the exports of other countries while the level of backward participation in global value chains is expressed as the presence of the foreign value added came from other countries in the exports of the domestic country. In this study, in addition to the gross exports, GDP and exports of value added are used as denominators in the participation indices in the empirical analysis. Thus, the impacts of domestic and foreign value added in the export value chains on the total factor productivity growth are estimated for the years between 1995 and 2014 by using the dynamic panel data techniques. Our estimation results from the full sample indicate that although higher backward participation reduces TFP growth, higher forward participation raises TFP growth for the full sample. We also find the significant positive results for backward and forward participation only for developed countries. Thus, our results mainly imply that developing countries do not able to benefit from participating in export value chains either backwardly or forwardly. Küresel değer zincirlerine ileriye doğru katılım düzeyi başka ülkelerin ihracatında yerel katma değer ile varlık gösterilmesi olarak ifade edilirken geriye doğru katılım düzeyi ise başka ülkelerin ilgili ülkenin ihracatında yerel katma değerleriyle varlık göstermesi olarak ifade edilmektedir. Bu noktadan hareketle, yaygın olarak kullanılan küresel değer zincirlerine katılım endeksleri, küresel değer zincirlerinin alt zincirleri sayılabilecek ihracat değer zincirlerindeki yerel ve yabancı katma değerin rekabetini ifade etmektedirler. Bu çalışmada, ampirik analizlere dahil edilen küresel değer zincirlerine katılım indekslerinin paydalarında brüt ihracata ek olarak GSYH ve katma değer ihracatı da kullanılmıştır. Bu farklı endekslerle ihracat değer zincirlerindeki yerel ve yabancı katma değer rekabetinin toplam faktör verimliliği üzerindeki etkileri dinamik panel veri modeli kullanılarak 1995-2014 yılları için tahmin edilmiştir. Veri setini ülke gruplarına göre ayırmadan yaptığımız tahminde, ileriye doğru katılımın toplam faktör verimliliği üzerindeki anlamlı pozitif etkisini ve geriye doğru katılımın da anlamlı negatif etkisini gösterdik. Veri setini gelir düzeyine göre ayırdığımızda, gelişmiş ülkeler için hem geriye hem de ileriye doğru katılımın pozitif etkisini tahmin ettik. Özellikle vurgulanması gereken bir bulgu olarak da, gelişmekte olan ülkelerin ihracat değer zincirlerine gerek geriye gerekse ileriye doğru katılımlarının verimlilik artışı üzerinde olumlu bir etkisini tahmin etmedik. Baum, C. F. M. E. Schaffer and S. Stillman (2007). “Enhanced Routines for Instrumental Variables/ Generalized Method of Moments Estimation and Testing”, Stata Journal, 7(4), 465-506. Baum, C. F., M. E. Schaffer and S. Stillman (2003). “Instrumental Variables and GMM:Estimation and Testing”, Stata Journal, 3, 1–31. Center for Systemic Peace (2016) “Polity IV Project: Regime Authority Characteristics and Transitions Datasets”. http://www.systemicpeace.org/inscrdata. html (04.10.2016). Foster-Mcgregor, N. ve Stehrer, R. (2013) “Value Added Content of Trade: A Comprehensive Approach” Economics Letters, 120(2): 354-357. Gereffi, G. (1994) “The organization of buyer-driven global commodity chains: How U.S. retailers shape overseas production networks” Gereffi, G. ve Korzeniewicz, M. (eds.) Commodity Chains and Global Capitalism, Westport (Connecticut), Praeger. Gereffi, G. ve Fernandez-Stark, K. (2016) “Global Value Chain Analysis: A Primer (Second Edition)” Center on Globalization, Governance & Competitiveness, Duke University. http://www.cggc.duke.edu/pdfs/ Duke_CGGC_Global_Value_Chain_GVC_Analysis_ Primer_2nd_Ed_2016.pdf (09.12.2016). Hopkins, T.K. ve Wallerstein, I. (1986) “Commodity Chains in the World-Economy Prior to 1800” Review, 10(1): 157-70. Johnson, R.C. ve Noguera, G. (2012a) “Proximity and Production Fragmentation” American Economic Review: Papers & Proceedings, 102(3): 407–411. Johnson, R.C. ve Noguera, G. (2012b) “Accounting for Intermediates: Production Sharing and Trade in Value Added” Journal of International Economics, 86 (2): 224–236. Johnson, R.C. ve Noguera, G. (2012c) “Fragmentation and Trade in Value Added over Four Decades” NBER Working Paper No: 18186. Koopman, R., Powers, W., Wang, Z. ve Wei, S.J. (2010) “Give Credit Where Credit Is Due: Tracing Value Added in Global Production Chains” NBER Working Paper No: 16426. Koopman, R., Wang, Zhi. ve Wei, S.J. (2012) “Estimating Domestic Content in Exports When Processing Trade is Pervasive” Journal of Development Economics, 99 (1): 178-189. Koopman, R., Wang, Zhi. ve Wei, S.J. (2014) “Tracing Value- Added and Double Counting in Gross Exports” American Economic Review, 104(2): 459-494. Ma, H., Wang, Z. ve Zhu, K. (2015) “Domestic Content in China’s Exports and Its Distribution by Firm Ownership” Journal of Comparative Economics, 43(1): 3–18. OECD (2015) “OECD Technical Workshop on Foreign Direct Investment and Global Value Chains”. http:// www.oecd.org/std/its/oecd-technical-worshopon- foreign-direct-investment-and-global-valuechains- 19-october-2015-paris.htm (15.11.2016). OECD-WTO (2012) “Trade in Value Added: Concepts, Methodologies and Challenges (Joint OECD-WTO Note)”. http://www.oecd.org/sti/ind/49894138.pdf (10.11.2016). OECD-WTO (2016) “OECD-WTO: Statistics on Trade in Value Added”. http://dx.doi.org/10.1787/data- 00648-en (14.11.2016). Stehrer, R., Foster-Mcgregor, N. ve de Vries, G. (2012) “Value Added and Factors in Trade: A Comprehensive Approach” wiiw Working Paper No: 80. Trefler, D. ve Zhu, S.C. (2010) “The Structure of Factor Content Predictions” Journal of International Economics, 82(2): 195–207. UNCTAD (2016) “United Nations Conference on Trade and Development Statistics Database”. http:// unctadstat.unctad.org (25.10.2016). Wang, Z., Wei, S.J. ve Zhu, K. (2013) “Quantifying International Production Sharing at The Bilateral and Sector Levels” NBER Working Paper No: 19677. World Bank (2016) “World Development Indicators (version date: 14 October, 2016)”. http://data.worldbank. org/data-catalog/world-development-indicators (13.11.2016). ISNAD YANIKKAYA, Halit , ALTUN, Abdullah . "Impacts of Participation in Export Value Chains on TFP Growth". 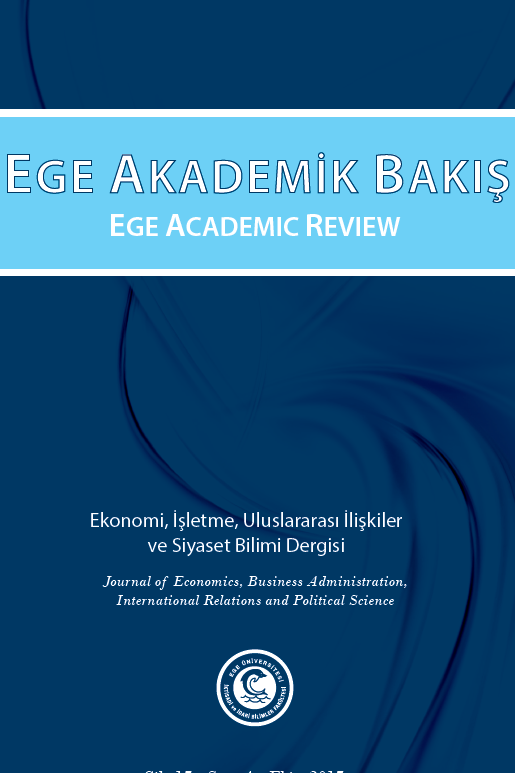 Ege Academic Review 19 / 1 (January 2019): 119-129.